Lao Yang (Tu Men), the center of this tale, is a despicable sixty-something pater familias who at first just seems a wretch. His wife is dying in the hospital and he is lavishing expensive gifts on his mistress and grandson and blowing cash at cheesy massage parlors and Mahjong dives. And it gets worse. His married siblings wrangle over the cost of an operation for his wife, their mother, and when they reluctantly agree and put money together, he steals it and blows it. Then an old shepherd buddy leaves him his camel, which is awaiting the vet, and he sells the camel and pawns his little motorbike to buy a cow, which he fobs off on his naive friend as more profitable than the camel. The family are so angry they lock him in a cellar. But cell phones are wonderful, and he gets the police to let him out, and sues his family. That, later, he regrets, when he wins. But in this beautifully photographed film (by Belgian China resident Matthias Delvaux) with its compelling lead performance there is more than just the picture of an aging rogue digging himself into a deep dark hole. This is a grim watch but also a complex and original one - even if its picture of modern China, with its failed new city and squabbling, mercenary and selfish youngsters, is not so unusual. The setting plays a constant role. It is the city of Ordos. And therein lie Lao Yang's extenuating circumstances. In Inner Mongolia, it's perhaps the government's most spectacular failure among its new towns to resettle populations in (hopefully) growing industrial areas. It's a vast cluster of old slums and abandoned new highrise developments laced with grandiose statuary. 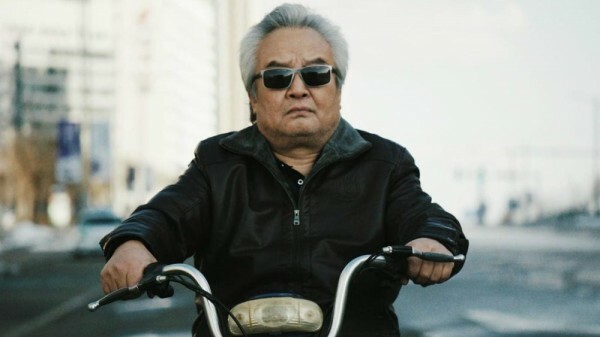 As Lao Yang tools around on his little motorbike, with his small, plump body and big head topped with a grand mound of pearly gray hair, his bravely youthful leather jacket and pseudo-stylish sunglasses, the Neverland of failed urban development hovers with mocking indifference behind him. Here, real estate collapsed, and Lao Yang was in real estate. But before that decline of his fortunes, he was successful, and from his manner, probably powerful (the actor, Tu Men, once notably played Genghis Khan). He worked hard to get his children educations and set them up with careers and spouses. Now, they don't need him. In this context, his dissolute behavior is an act of protest in the face of ingratitude. The spouses of the children are chillier than the children themselves. These general facts either you know or you figure out, in watching. They are embedded in the action, emerging in remarks Lao Yang makes. "You don't like Lao Yang?" this movie says: "Well, just look at the rest of his family." There's no one to like. At first, with his late night gambling and his outer polish and mask of white hair Lao Yang made me think of Roger Duchesne in Jean-Pierre Melville's Bob le Flambeur. But Bob is a benevolent, failed crook, whose gambling hurts nobody. His elegance doesn't get tarnished. He is nice to his concierge. Still Lao Yang is an unusual choice of protagonist and he makes you cast around. Later as events stayed gloomy and got darker and Lao Yang got blood on his nose and mud on his shoes, my thoughts turned to the films of Robert Bresson. But that won't work either because here the struggling is menial and never ennobled. There are indications in this feature debut that Jhou Ziyang is a quite original voice. He has found a unique point of view in this unlikable protagonist, and a specific place in this big hulk of a city. What is Lao Yang doing at the end when he returns home to care for his dying wife? Has he reformed? Has he repented? Or has he merely found the only comfortable birth for himself and a new maliciousness behind a new mask? At times he has only his cigarettes and his flip phone, and his cigarettes are rumpled and his flip phone is losing power. Lao Yang is one of the loneliest men in Chinese cinema. And that's something to see. Old Beast/ 老獸 Lǎo shòu ("Old Beast"), 108 mins., first appeared in July 2017 at Xining, then was noticed at Tokyo in Oct., and Taipei in Nov. and it was reviewed by Richard Kuipers in Variety and Clarence Tsui in Hollywood Reporter. It won three prizes and four nominations, getting the FIPRESCI Prize, Best Actor, and Best Screenplay (and Zhou penned his own screenplay) at Taiwan's Golden Horse awards. It received theatrical releases in China (Dec. 2017) and Taiwan (Jan. 2018), with other festival showings (Miami, Singapore); it was screened for this review as part of the New York Asian Film Festival at Lincoln Center, where it shows Tues., 3 Jul. 2018 at 9 p.m.